Victory, Soaring Eagle 27 x 11 x 7 in. Featuring artist quality collection of realistic and collectable wildlife Birds 2 sculpture artist editions. Adopted as the National Bird in 1782, the eagle was chosen for it's long life and majestic beauty. The eagle is not afraid of a storm; is strong, and is smart enough to soar above it. True, God loving patriots, soar on such eagles wings. The American Bald Eagle wears no material crown and is subject to no worldly King. Available in various custom finishes: Natural Realistic, Faux bronze, Verdigris, Faux Pewter, Custom Faux Marbles.. Our strong' Poxyporcelain ©' is very exterior durable!! • World wide collectable artist, proudly made in USA exclusively by Chris Dixon Studios. Our strong Poxyporcelain© is very exterior durable!! • World wide collectable artist, made in USA exclusively by Chris Dixon Studios. . While creating this eagle statue I was struck by these observations: There are 50 feathers on the wings for our 50 united States. There are 13 tail feathers for our 13 original colonies." nThe National Bird of the United States is the American Bald Eagle. Adopted as the National Bird in 1782, the eagle was chosen for it's long life and majestic beauty. The eagle is not afraid of a storm; is strong, and is smart enough to soar above it. True, God loving patriots, soar on such eagles wings. The American Bald Eagle wears no material crown and is subject to no worldly King. Our strong Poxyporcelain© is very exterior durable!! 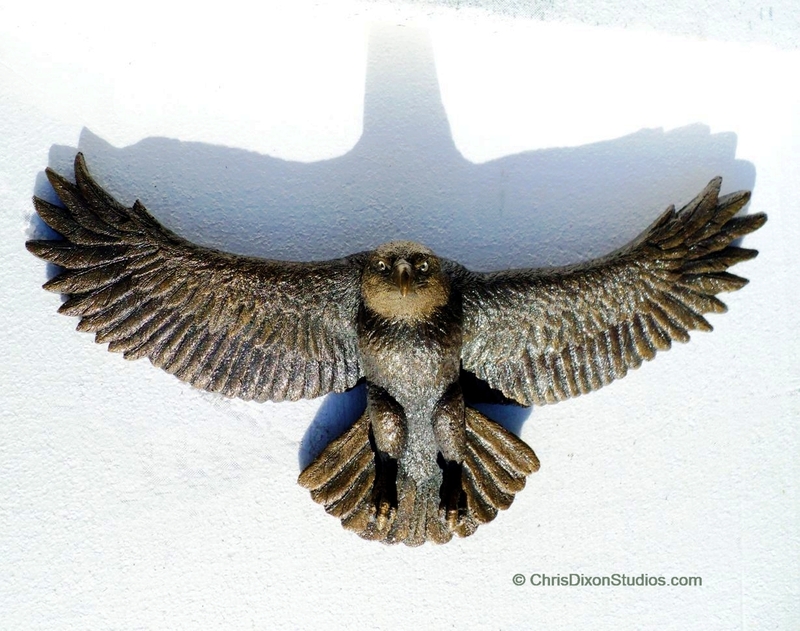 • World wide collectable artist, made in USA exclusively by Chris Dixon Studios..
• The artwork is cast with hand painting to a very natural look. Brand new with artist signature, copyright and unique hang on card. Please tour Chris Dixon Studios .Com for more information. • "Cast Stone", a unique artist's blend of durable, high strength and nontoxic artists' materials. • World wide collectable artist with over 30 years of professional sculpting experience producing fine details and quality of craftsmanship ..Thank You for your patronage. Proudly made in USA. The brass eagle bronze metallic finish is ideal as a presentation award trophy for government and civic ceremonies. Show your patriotism by displaying our national symbol while supporting a product that is totally made in USA. • Made of solid "Cast Stone", a unique artist's blend of durable, high strength and nontoxic artists' materials. This sculpture is topped with a clear coat for added finish protection and luster. The artwork has artistic hand painting for a very natural look. ...Thank You for your patronage. Proudly made in USA. American Eagle Plaque 14X30 in. Birds Hummingbirds Plaque 12 in. Wood Stork Lifesize 32 in.